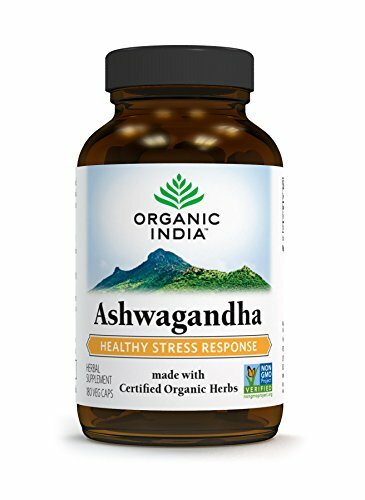 Organic India Ashwagandha naturally relieves the stress by pacifying the nervous system. The stress relieving formula contains the pure botanical formula, which promotes healthy nervous system, reproductive system and endocrine system. Make your body healthy with organic Amazon imported herbal supplement in Pakistan. So hit order now for placing your order. -REGENERATES ENERGY AND VITALITY - This rejuvenative tonic helps support your body s natural energy and metabolism, stabilizing blood sugar and boosting adrenal health. A natural remedy for adrenal fatigue. -USDA CERTIFIED ORGANIC - Our capsules are synthesized from USDA-certified organic herbs, caringly grown and cultivated on sustainable, organic farmland. No GMO, no gluten, and vegan. Kosher and Halal Certified.